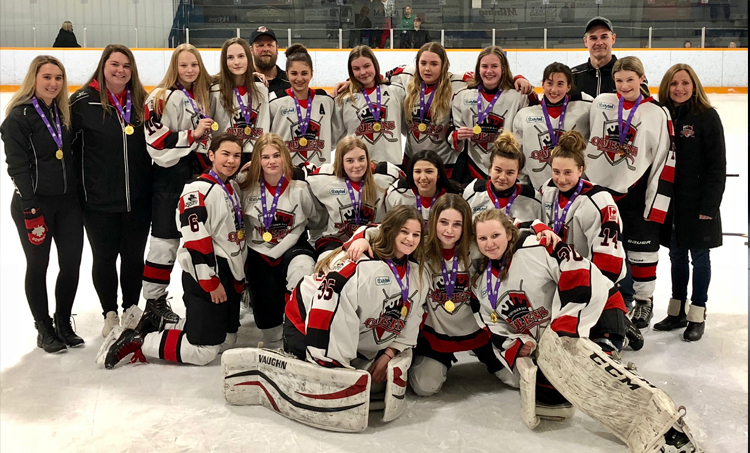 WINNIPEG, MB — The Bantam A Queens are coming home from Winnipeg with Championship gold! The Queens won the Stars Cup Tournament after defeating Dryden 2-1 off a goal from Kaitlyn Whatley (assisted by Jenna Jackson and Grace Fitzpatrick) and the game winner from Fitzpatrick (with Paige Fucile and Whatley drawing assists). In all, the Bantam A Queens went 4-0 in Winnipeg, outscoring their opponents 11-2 in those games. WINNIPEG, MB — The Bantam A Queens are in Winnipeg this weekend competing in the Stars Cup. They got started Friday night with a contest against the Rat River Saints. In the first,Victoria Arnone’s shot from the point would find a home in the back of the net, putting Thunder Bay up by a goal. Jenna Mazan drew the lone assist. In the second period, Grace Fitzpatrick would take a feed from Shailyn Reguly and score and then Fitzpatrick would knock in her second goal of the period, giving the Queens a commanding 3-0 lead after two. The score held until the last minute when Kaitlin Whatley would manage a 4th goal for her side. Goalie Presley Brohm was stellar in her shutout bid. 4-0 final. Saturday morning, the host Winnipeg Stars awaited the Queens and proved to be pretty tough competition as both teams entered the 3rd period scoreless. Fitzpatrick would break the double-shutout, scoring after a play from Jenna Jackson. Winnipeg responded with a goal of their own but Siobhean McLaren would get the puck to Shailyn Reguly who’d score with 2:31 left. Netminder Mia Attema held the 1-goal margin as the Queens won their second of two games in the tournament. 2-1. That afternoon, the Queens met the Dryden Warriors. Fitzpatrick continued her scoring streak, getting the Queens on the board in the first and would notch another goal in the second! Both goals assisted by Reguly and Jackson. Less than two minutes after Fitzpatrick’s second goal, Paige Fucile found Mikayla Valante with the puck which she’d bury in the net to give the Queens a 3-0 lead. Presley Brohm continued her shutout streak. Thanks to their 3-0-0 run, the Bantam As advance to the Championship game on Sunday afternoon. 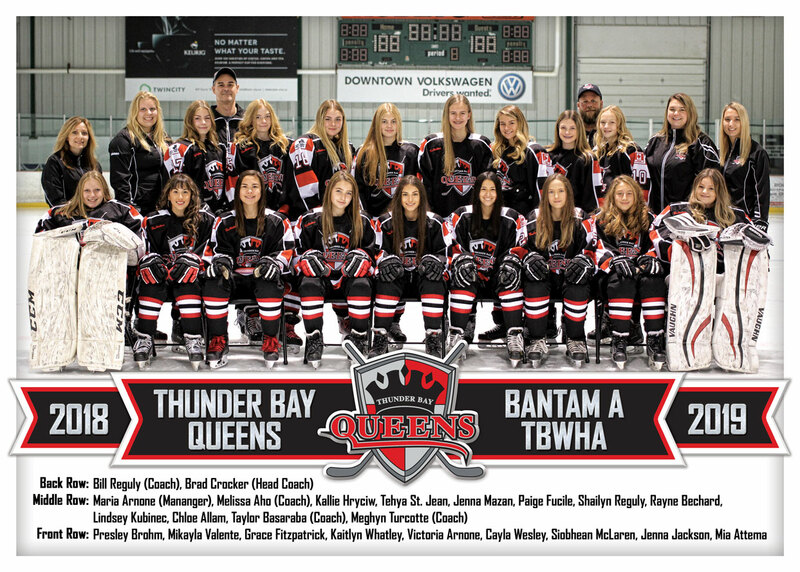 THUNDER BAY, ON — After two one-goal losses on Friday, the Bantam A Queens were still seeking their first win of the Norwest tournament as they took on the Elks 82s Saturday morning. The Queens trailed 1-0 going into the third period when Paige Fucile would tie the game. Elks took the lead again with 8:30 left in the game but Mikayla Valente would setup Kaitlin Whatley to score just 25 seconds later to tie it back up. No more goals were surrendered in a 2-2 draw. In the afternoon the Bantam As met the Fort Frances Canadians who’d manage 3 goals in the second period. The Queens were unable to find a response, dropping the game 3-0. Meanwhile, the Peewee Queens started Day 2 of the Norwest tournament with a 1-1 tie against the Emo Express. After a scoreless first period, Emo would jump out to a 1-0 lead early in the second. The score remained that way until late in the period when Avery Olenikmade a great individual play to undress the Emo defender before scoring high on the short side to tie the game. Abby Willsmade some clutch saves in the 3rd period and a total of 16 saves for the game to secure the important point and allow the Queens to advance to the semi finals. The Queens semi final opponent will either be the Dryden Paper Kings or the Elks 82's in a rematch from round robin action. Game time is 9:15 @ TC2. The winner advances to the championship game at 2:30 at Norwest Arena.